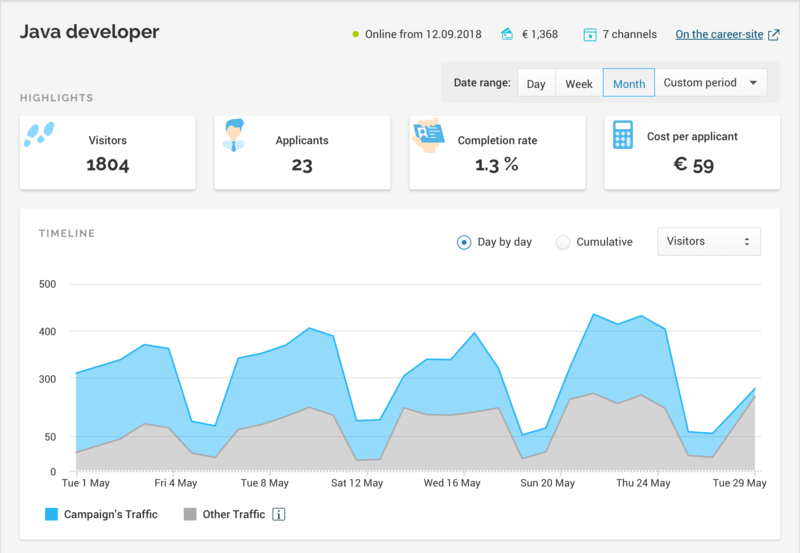 You can now activate for free the newly-added Recruitment Analytics at VONQ’s Job Marketing Platform to track your full candidate journey: everything from source to hire. Relying on data to make decisions takes the guesswork out of your recruitment marketing process. It helps you gain a deeper understanding of the labor market, predict the future, and plan more effectively. No surprise that for more than 50% of recruitment professionals in Europe (European Recruitment Trends 2019 Survey by VONQ), collecting and measuring candidate data will be a top priority in 2019. What type of data, though? And how to easily collect and make sense of it? What’s new at VONQ’s Job Marketing Platform? We now offer you Recruitment Analytics at the Job Marketing Platform to better understand and measure your full candidate journey. Easy to activate and for free! So, let’s see what the newly-added Recruitment Analytics is all about! Tracking those steps of the candidate engagement will help you find the answers to: Which is your top source for attracting applicants? ; In what moment your candidates drop off the most? ; Is your application form too long? ; Are you targeting the right candidates? ; Which part of the candidate journey you can optimise? ; What is your overall conversion rate? ; and many more. To avoid the old-fashioned recruitment approach of simply spray and pray, you need to know where your applicants come from, so we capture the sources – that is, channels – from which candidates are visiting your pages and how they move through your career site. Knowing your top performing channels allows you to optimise your media budget, make smart decisions based on data insights, and boost your employer brand awareness among your target audience. Often, the challenge is not mining data, it’s understanding it. Having an easy-to-grasp, intuitive dashboard is key to quickly interpret and draw conclusions from your data results. That is why the Recruitment Analytics dashboard provides relevant data only – for you and your specific recruitment marketing efforts. So, no need to configure it yourself, we take care of that for you. I’m already using Google Analytics. How can I further benefit from Recruitment Analytics? I’m already getting data insights from my ATS. How can I further benefit from Recruitment Analytics? 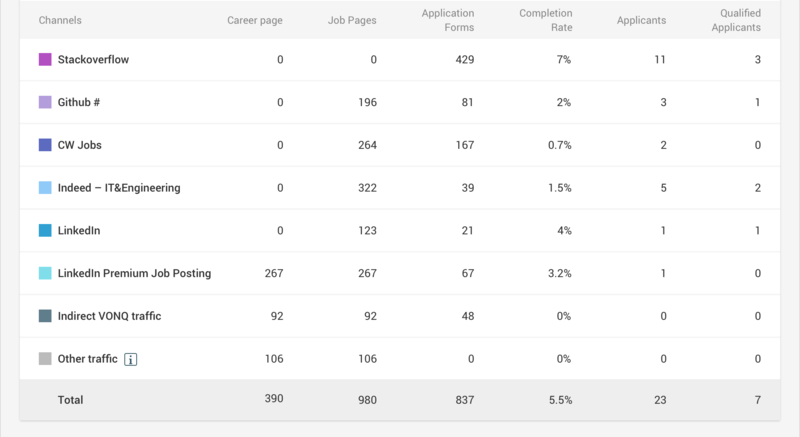 See this graph for a quick comparison between an ATS and the Recruitment Analytics of the Job Marketing Platform. I’m ready to get started with Recruitment Analytics! What shall I do? Getting started with Recruitment Analytics is easy as 1, 2, 3! All you need to do is 1) log into your Job Marketing Platform’s account, 2) click on the tab Analytics, and 3) click on the Get Started button. You’ll then be guided through the simple process of activating Recruitment Analytics. We can’t wait to get you started, so go ahead and give it a try today!